In this highly specialized field Bancroft Amenities are one of the most experienced contractors in the county, having performed cricket square construction, refurbishments and renovations at prestigious sites all over the UK and in Ireland including Old Trafford, home to Lancashire County Cricket Club and world famous test venue. Bancroft’s are able to bring to the project highly skilled and experienced operators, combined with modern specialized equipment enabling a rapid and smooth completion of projects even when dealing with difficult to handle materials that are required in cricket construction. They usually involves stripping off the existing surface using a Koro Field Top Maker, special attention is given to the ends to remove “saddle” effect that often develops over the years. The depth of the strip depends on the thatch levels and the unevenness of the existing square. Light cultivation to “key” in the new loam is then undertaken following the addition of the new loam which is chosen to match the existing conditions the square is then graded to achieve as smooth a surface as possible within the confines of the existing surround interface. Overseed and fertiliser application are the final operations, the final finish is achieved with highly skilled operators using specialized equipment. The intensity of these depends very much on the existing conditions but generally involve intensive scarification, overseeding, spiking and top dressing with the addition of an autumn/winter fertiliser. This is a highly skilled operation requiring detail and experience both of which are available at Bancroft’s. We have built numerous new squares over the years all over the UK including Prestigious Sites. Lancashire County Cricket Club awarded us the contract to construct 11 new pitches at their Old Trafford ground involving extremely deep construction, detailed work, irrigation and stumpcam facility. 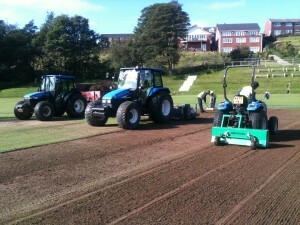 Bancroft’s also carry out outfield drainage, leveling and construction works.